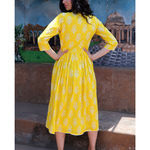 Bright yellow cotton dress with block printed motif all over and one button closure in the front. It has gathers at the waist with fabric buttons at the back. Pair it up with your favourite wedges and you are ready to go for that brunch party!